Sitting on a plane for four hours, in a relatively small seat (and I’m only 5’7″ and 150 lbs, I can’t imagine being six foot and chunky) I drift to two thoughts: I really want to make more money so I can always fly first class, or, I wish I could fly myself. 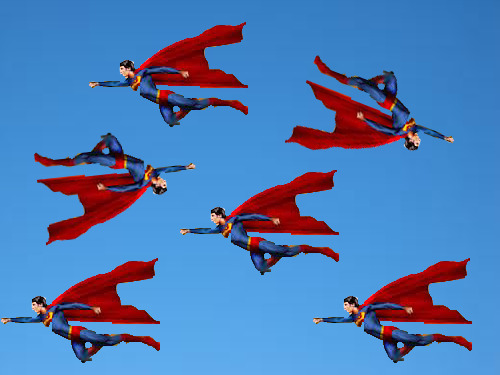 But what if we all flew ourselves, super-hero style? Is it possible that we could all possibly navigate air travel without hourly fatalities? I’m not able to walk the six blocks from my house to the train without having to swerve wide to avoid a couple who obviously paid extra for their all-encompassing use of the sidewalk. So what would happen in the air? Now one might argue that given the ability to fly, the other powers would exist and our super-human strength would render the bumps and bruises meaningless. But if we are all men and women “of steel” then um, ow. I’ve heard metal hit metal and it doesn’t sound like fun. You may argue further that we would also develop a tremendous power of perception and awareness of our fellow human beings, but I would snap back with “you’re rubber and I’m glue”…no wait…I’d say that we would still be human and therefore selfishness would trump and we’d be smacking into each other left and right, dropping like flies and making more potholes. So I’ll plug the earphones in and open my book. The movie is another one based on a Nicholas Spark’s novel and I’ve already seem The Notebook.